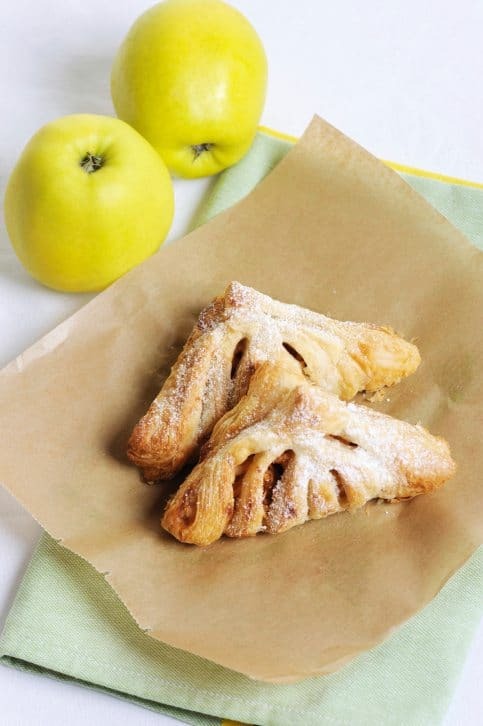 While nothing beats the taste of fresh apples, this delicious recipe just might. It combines cinnamon and all spice with fresh apples, creating a yummy taste apple pie that will help you kick-start the fall season. Apples are a delicious and nutritious fall fruit. Researchers found consuming Red Delicious or Granny Smith apples can help prevent and repair oxidation damage that happens during normal cell activity. Each medium-sized apple is filled with 4-grams of fiber called pectin. This fiber has shown to fight against the onset of Parkinson’s disease and it keeps you feeling full for longer. They are also filled with antioxidants that promote heart health and lower risk of death from heart disease and cardiovascular disease. Leaving the peels on, cut or grate the apples and mix with sugar, cinnamon, and all spice. Let sit in fridge for 30 minutes. Roll the biscuit dough out as thinly as possible. Using a 4″ round cookie cutter or small plate template, cut the dough in circles. Spoon the apple mixture into the dough. Fold circles over and pinch the edges with a fork. Cut two small slits (about an inch in length) in the middle of the pie to let steam out. Place the pies on a non-stick pan (or line with parchment paper). Brush melted butter over pies and sprinkle some cinnamon or sugar on them. Bake for 20 minutes and let cool for 10 minutes. Bonus: Once the apple pie has cooled and you have cut a slice, it’s time to consider toppings and sides. Vanilla ice cream and whipped cream are classic choices, but those are the only yummy options. A caramel and a maple glaze would be yummy. Or you could serve your pie with a slice of cheese.